This 11th collection from Alice Major continues her long engagement with science and mathematics, which (like poetry) are ways we try to find meaning in the universe. The Anthropocene is a term that has been picking up velocity in scientific circles over recent decades, as we try to come to terms with how (and how much) human activity is shaping the planet. The section that gives the book its name is a long poem in the satiric spirit of Alexander Pope’s Essay on Man. It draws on biology, evolutionary science, current events and ultimately cosmology to ask the down-to-earth question: where do humans belong “…in a wholeness where / everything is common and everything is rare”? Expanding on this dilemma, other sections of the book explore how we get along in this complicated period when it can hard to figure out how to do much about the big stuff in our small way, when we have to make a living, when people get consigned to the margins, when other animals have to live with us – and when poets have to work with the same brains as every other human to make their kinds of meaning. The poems in “Long division” turn personal, as the poet tries to use mathematical patterns to make sense of questions about issues like congenital illness and gender that have touched her own life. Welcome to the Anthropocene is a witty, varied, sparky response offered at one of humanity’s most complicated turning points. this world that life could never love enough…. In Welcome to the Anthropocene, Major sets up the natural world as dominant over our knowledge of it. She avoids suggesting that science can save us from our current predicament by satirizing those who are interested in an easy fix: “We can fix / anything, we are smarter than bacteria. There isn’t any reason for hysteria. / We’ll plant some trees.” This sentiment provides tension in a book that finds truth and beauty in science, but which also has critiques of some of its processes and outcomes. Because the universe is big and all but incomprehensible, the average Jills and Joes don’t dare ask too many existential questions. It is left to poets to face the truth in those places the rest of us fear to tread. The author of eleven books of poetry and essays, Edmonton’s first poet laureate, and a woman comfortable in the realms of math, science, and cosmology, Alice Major is uniquely qualified to guide humanity through perilous ecological times. Thank you, Alice. 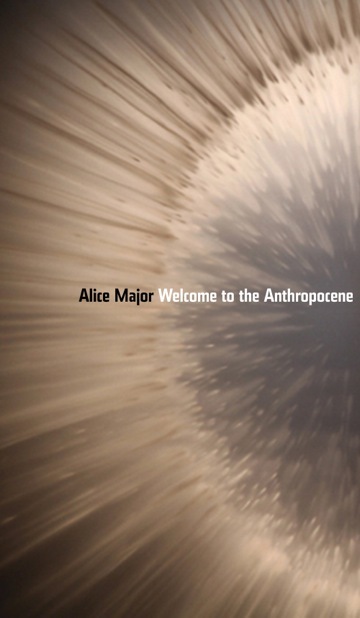 Alice Major begins Welcome to the Anthropocene by considering all the ways humans have meddled with the environment … before acknowledging a discomfiting paradox: the greater the destruction, the more convinced we become of our species’ significance in the face of time and space too vast to comprehend. The traditional and experimental forms which appear throughout the book reinforce Major’s argument … She excels at depicting situations when humans are themselves little more than kind animals, unusually intelligent but never quite intelligent enough, and often confounded by their own place in the ecosphere. Poems like “Old Anna” and “The Afternoon Before the Clocks Turn Back” are standout examples. Poets work like naturalists or scientists. What they do is based on what has gone before. … The poet has had fun writing these poems, which is a good sign for the reader. They poems are serious but the reader can expect to have fun reading them. This is poetry with a brain as well as a heart – it not only makes us feel but also succeeds in making us think. This collection is by turns a lament, a dirge and a celebration of being on earth in this human-dominated moment. It is a book of hefty, rhythmic poetry that demands our listening and asks for repeated readings—an intelligent book that expects its readers to think about the verse they are reading and about the world they are harming just by being here. …. Major’s ecologically minded poems demonstrate anew why poetry and art play leading roles in helping us to conceive of better times that are yet to come. With its zeal and intellectual thrust, Welcome to the Anthropocene is a work of some power and also a gem. With its clever organisation around the introductory first poem, the collection may be said to resemble the “murmuration of starlings” wherein outliers shape the progress of the flock as a whole: here I refer to the shifting borrowings from the leader poem as epigraphs starting each section. Alice Major’s Welcome to the Anthropocene is a confrontational yet compassionate collection of 57 poems that cut through the fluff of everyday life and deliver insight into the human-driven world we live in.